Iced Peach Tea and Orange Juice. There's nothing special about the drinks, except that they are slightly too expensive that they should be. 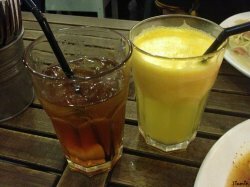 The Iced Peach Tea was RM4.50, and the Orange Juice was RM5.00. Anchovies Poached Egg Spaghetti with Chicken. 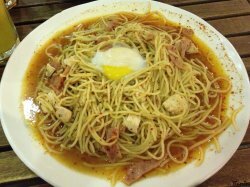 It was a plate of pasta with crushed peppers, cooked together with olive oil and chili, and topped with a poached egg. I requested for one without anchovies because I never like anchovies. Definitely, just like many other dishes available in the cafe, you can choose between chicken and beef. Because of the generous amount of chili added by the chef, halfway through enjoying my meal, my sweat was close to dripping from my cheeks. Chicken Spallopini Pasta. My boyfriend, Don, and I thought that it was slightly too salty for our liking. Don is always a person who prefers stronger flavor than I do, so you can pretty much imagine it based on your preferences. 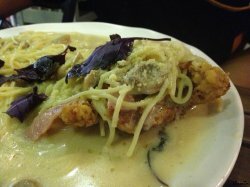 Despite so, Don enjoyed his meal that night, perhaps due to the special environment and the unusually huge portion. 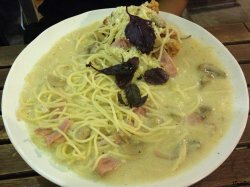 Surprisingly, the services of the cafe of the night was much better compared to my previous visit (http://my.openrice.com/klangvalley/restaurant/commentdetail.htm?commentid=39759), although the food served was yet to be improved.